A. fumosus Boriss. in Not. Syst. (Leningrad) 10:50 (1947). Procumbent to ascending, perennial herb, 10-30 cm; stems 10-25 cm. Leaves 1-2.5 cm; leaflets 2-7 mm, narrowly elliptic, adpressed bifurcate-pilose, (8-)12-J6-paired; stipules 1-3 mm, lanceolate, joined at the base. Inflorescence c. 1.5 cm diam., a dense, globose, 8-15-flowered spike, elongating in fruit. Bracts c. 2 mm, lanceolate. Calyx 5-6 mm, campanulate, adpressed bifurcate-pilose, with short black and long white hairs; teeth 2-3 mm, linear, predominantly black-hairy. Corolla violet; standard 9-13 mm, glabrous. Legume c. 5x2 mm, ovoid, erect, white simple-pilose; beak c. 2 mm, curved. Fl. 5-6. Igneous and dry stony slopes, oakwoods, etc., 650-2000 m.
Type: [Turkey A8] Artvin, in declivibus siccis Iapidosisque ad fluvium Czoroch prope Ordshoch, 9 vi 1914, Turkevicz 742 (holo. LE!). E. Anatolia. A9 Coruh: 6 km from Ardanuç to Ardahan, 650 m. Hub.-Mor. 16156! B9 Van: 24 km from Gürpinar to Hoşap, 2000 m, D. 44697! B10 Ağri: 35 km E of Doğubayazit, 1600 m, D. 43971! Endemic. According to Borissova, A. fumosus is related to A. hajastanus Grossh. from Soviet Armenia. 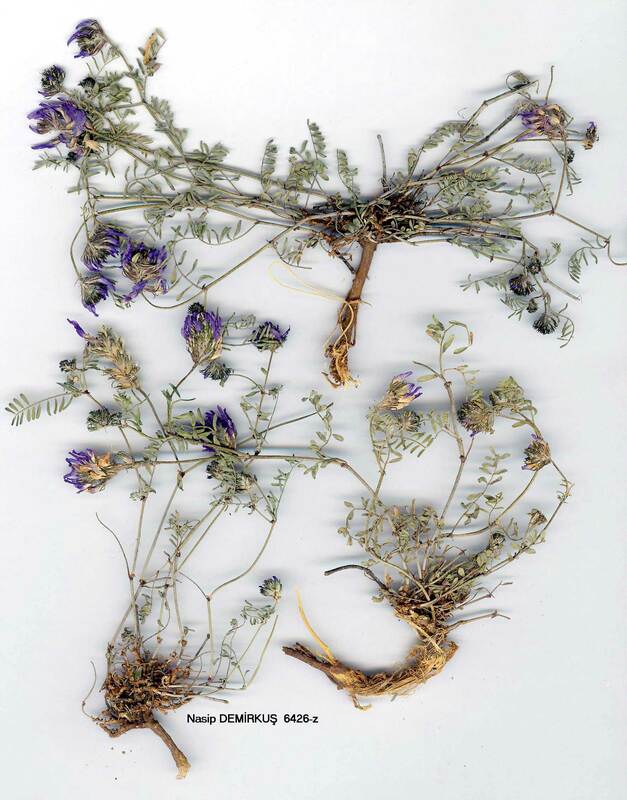 The specimen from B9 Van (D. 44393), differs from the type in being taller, c. 25 cm as opposed to c. 10 cm, and in having larger leaflets, 5-7 mm, not 2-5 mm.